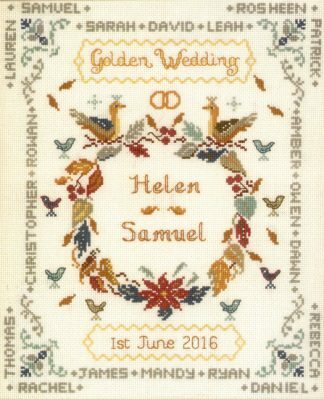 A cross stitch 50th wedding anniversary card kit to stitch for a special Golden wedding anniversary gift. The Garland Golden anniversary design has distinctive detail with beautiful garlands embellished with twinkling beads. The colours are a lovely blend of golds, greens and mauves. Glamour is added with gold metallic thread and a charm. This design has a lovely blend of golds, greens and mauves with beautiful garlands embellished with twinkling beads. The kit has a heart padlock charm and gold metallic thread to add a touch of glamour. This Garland Golden Anniversary card cross stitch kit contains everything to create a greeting card on beige aida with an embossed floral garland. This 50th anniversary card kit has only top quality materials ~ Zweigart fabric, DMC and metallic threads, charm, Mill Hill beads, needles, card and envelope. A full alphabet is provided for you to add names and date. This Charm Golden Anniversary card design is from the Decorative Textiles collection.